Topics: Application Articles, Modulated Power Supply, Who We Are, and How To Measure Ldo Psrr. There are 2 Nameservers, ns50.domaincontrol.com, and ns49.domaincontrol.com. Godaddy.com Inc (Arizona, Scottsdale) is the location of the Apache server. 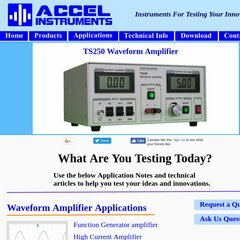 Accelinstruments.com's server IP number is 184.168.139.1. PING (184.168.139.1) 56(84) bytes of data.